We’ve Found The Best 10000 Watt Generator! Here’s Johnny! Why Should I Choose The 10000 Watt Generator? As you may have observed in different literature and online contents, the 10000 watt generators have different functions and features. Specifically, they vary with power output and sizes and are best used for both tedious and simple activities such as construction activities as well as powering homes and business. The size of a generator largely depends on the quantity of items that requires power. Being a lover of appliances, I have however had experiences with 10000 watt generators and I can assure you of the right generator to get for your home or office. Importantly, this will enlighten you on which is worth spending your money on. If you’re looking for a generator which is versatile with fuel options, Pulsar PG10000B16 is one of the best 10000 watt generators. The uniqueness of Pulsar PG10000B16 is that it can switch to the fuel mode while being used without being restarted so that your work is not interrupted in any way. This technology is called as ‘the Switch and Go’ by Pulsar. The Pulsar PG10000B16 can be powered by both liquid propane as well as by gasoline which can be interchanged during use. Pulsar PG10000B16 can power many appliances as well as tools at the same time with its power making technique. This technique makes it even more ideal choice for you. The outputs of the Pulsar PG10000B16 vary according to the fuel use but not to an extent. It can deliver 10000 peak watts by running on gasoline whereas the peak power on liquid propane is 9000 watts. The Pulsar PG10000B16 can run for a maximum of 12 hours on gasoline at 50% load giving it a good run time considering its power as well as versatility. The overall build quality of Pulsar PG10000B16 is quite good considering the handles on it which are collapsible, and the plastic wheels are convenient too. The Pulsar PG10000B16 is high on practicality as well given the number of output sources. The output options available are four 120V outlets, one 120/240V twist, and lock outlet as well as one 120/240V 50A outlet. These outlet ports mean that you can run multiple appliances at the same time. Duro Max has a reputation for supplying generators which are robust, well priced as well as work hard. In the wide range of generators offered by Duro Max, the Duro Max XP10000E is perfectly placed in the 10kW generators category. The Duro Max XP10000E has a 16 HP engine with a cubic capacity of 420cc and is safe to use, isn’t very noisy as well as is extremely dependable. It comes with an 8.3-gallon fuel tank to ensure that refueling frequently is not required. It can run up to 10 hours at half load easily which is its strong point. 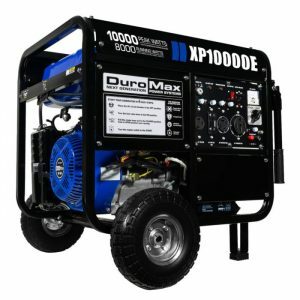 The Duro Max XP10000E also offers electric and recoil start which puts it at par with all the other generators in the category. The Duro Max XP10000E also provides a unique 120V 30A outlet which means that you can use 120V operating large tools without any hassle. It also has an idle switch which makes it extremely efficient. It has two standard 120V household outlets, a large 120V/240V 50A outlet for connecting power directly to your house wiring, a 120V 30A outlet, and a 120V/240V RV outlet. These outlets have individual circuit breakers as well as the main circuit breaker. The sturdy build of the Duro Max XP10000E ensures that the fuel tank is well protected as well as the large wheels present on it make it easier to carry than ever. It also has collapsible handles and thus takes up lesser space. 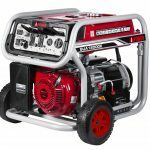 The Champion Power Equipment 100161 may not be the strongest contender in the 10kW Generators category but has its own definite shortcomings. It delivers 7500 peak watts and continuous running power of 9375 peak watts. This is a small difference as compared to the other competitors which shouldn’t affect the use too much on a daily basis. The strongest suit of the Champion Power Equipment 100161 is the remote control feature. This is a feature which is not available on all generators. It can be operated remotely using the remote control from a considerable distance of 80 feet. Another good thing about it is the plastic cover on the outlets which protect them from the dust and moisture present in the air. It comes with a six-gallon fuel tank which helps it run continuously for 8 hours at half load. This makes it highly efficient if not the longest running of the set. It has an electric and recoil start along with a cold start technology which helps it start in any conditions effortless. The Champion Power Equipment 100161 also offers a 5kW per gallon efficiency making it highly affordable to run. The control panel has 2 X duplex 120V 20A household power outlets (a total of 4 outlets), 120V/240V 30A RV outlet, 120V/240 30A locking outlet, and a 120V/240V 50A RV/house power outlet giving it a variety. HONDA EB10000 Industrial Generator is one generator that you can easily take to the site of job and which can handle a lot of rough use as well as abuse. This generator can outperform any of the other generators in the segment of 10kW easily with its power and practicality. The HONDA EB10000 Industrial Generator comes with 8.1-gallon fuel tanks which run on gasoline all day. Considering its work power, the HONDA EB10000 Industrial Generator is highly efficient as it offers 7 hours and fifteen minutes of run time at half load and four and a half hours at maximum capacity as rated by the company. The HONDA EB10000 Industrial Generator also has the strength of the brand behind it meaning that assistance is available round the clock for any issues that possibly arise. Though the HONDA EB10000 Industrial Generator is highly versatile, it is best used at job sites rather than at other places due to its lower noise reduction capabilities. It comes with a control panel which has various outlets including 4 20A 125V outlets, 1 30A 125/250V locking plug, 1 30A 125V locking plug, and 1 50A 125/250V locking plug. These outlets further increase the versatility of the HONDA EB10000 Industrial Generator. This generator is powered by a 630cc engine made by Honda giving it 10000 peak watts starting power as well as 9000 peak watts running power. For customers who require the most powerful and a highly rugged generator, they need not look any further than the Caterpillar RP12000E 12000 Running Watts/15000 Starting Watts Gas Powered Generator 502-3699. The versatility of this generator is that it can be both used for job site purposes as well as for residential requirement. This generator is one that goes beyond the 10kW range with its running power of 12000 peak watts and an astonishing 15000 starting peak watts of power. The humongous power which this generator possesses is adequate to keep even the largest of tools and appliances running for a while. The Caterpillar RP12000E 12000 Running Watts/15000 Starting Watts Gas Powered Generator 502-3699 comes with a 3-year warranty for both the generator as well as for the parts giving you the peace of mind that should come with the generator. This generator provides 4 GFCI 120V 20A duplex outlets, 1 120V/240V 30A twist lock outlet, 2 120V 30A twist lock outlets, and 1 120V/240V 50A twist lock outlet to supply power for any appliance or tool that you might have. These outlets also have a plastic covering to keep the generator safe. This powerhouse is the one to buy if you are looking for versatility and a dependable workhorse. CAT is a brand that is trusted by all and thus offers great value for your money. 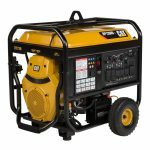 Looking for a generator for emergency use and home use? The All Power America APGG10000 is what you should consider. The All Power America APGG10000 is the perfect match for back up power to power all the possible appliances at home in the most fuel-efficient way. It is EPA certified and made to keep your family safe at home during natural disasters. The All Power America APGG10000 is powered by a strong 430cc Ducar engine which is highly durable. The All Power America APGG10000 puts out a good 10000 peak watts and 8000 watts rated power to influence your home. It comes with an 8-gallon fuel tank which provides a 12 hour of run time at half load which is impressive regarding fuel economy. The generator also produces 74 decibels making it really quiet generator and thus apt for residential use. This generator is made up with residential use in mind, and this can be seen on the control panel. It has1 120V AC twist lock plug, 4 120V AC plugs, and 1 120v/240V plug which is all that is required to power your home and the required appliances during a natural disaster or a blackout. The 4 120V AC plugs are specifically residential type plugs to ensure that they are compatible with the appliances. All Power America APGG10000 also offers a one-year warranty for all the products irrespective of demand and use. If you are a person who needs that little extra power above 10000 watts, then look no further. The Duro Max XP12000E is the perfect solution for you. The generator is versatile and can be used at both home as well as on a job site to get things moving. 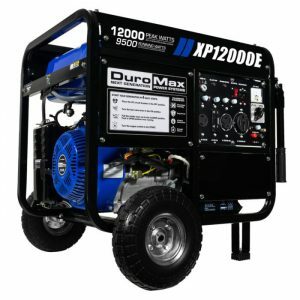 The Duro Max XP12000E is simple to use and handle and has more than enough power to run large appliances as well as tools. It puts out 12000 peak watts of impressive power along with 9500 running watts. The Duro Max XP12000E is a workhorse with its excellent run time of 10 hours at peak power without interruptions. With its rubber wheels and collapsible handles, it is ever ready to go anywhere with you. The control panel on the Duro Max XP12000E comes with a wide assortment of outlet options for you to pick from for the specific appliance that you will be using. This generator features 2 120V 20 Amp Standard Receptacles, 1 120v/240v 30 Amp Twist Lock, 1 120V 30 Amp Twist Lock Receptacle, 1 120v/240v 50 Amp Heavy Duty Outlet, and 1 10A 12V utility connection which can be used to charge a battery of a suitable size. It is fitted with a 457cc Duro Max engine which churns out the power required. The Duro Max XP12000E weighs about 260 lbs making it not too heavy to carry around. Though A-iPower is a lesser known brand, the products offered by it are on par with the best. The best example of this is the A-iPower SUA12000E. This generator is well poised against its competitors from the segment. 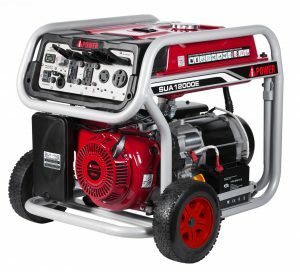 The A-iPower SUA12000E offers an electric start as well as is approved by CARB making it one of the only few in this list of generators. This generator puts out 12000 starting watts and 9000 running watts. It is also fitted with a high-performance alternator to ensure that you can use high power motor driven tools and appliances simultaneously. The A-iPower SUA12000E has a 459cc engine which puts out a respectable 16HP of power which is more than enough to power all the appliances which you would want to use. The outlets also have a cover for all of them to ensure that they stay covered and protected from any possible damage. The A-iPower SUA12000E also has a two-year warranty which covers all sorts of manufacturing defects. Though it is not the best in this segment, it still offers some peace of mind to the buyers with its other properties. It has a 7.2-gallon fuel tank which is enough for a workload of about 50% to run for about 8 and a half hours. Another option in generators which are used for home back up power is Gentron GT10020. It is most commonly known for its use as a RV generator, in natural disasters or a blackout or emergency home power use. The Gentron GT10020 is one of the most affordable alternatives in this collection of reviews, and that is why it stands out from the rest. It features a 420cc OHV engine which puts out 15 HP of power. The Gentron GT10020 offers 10000 watts peak power and 8000 watts of rated power which is about the average in this segment. Though fitted with a standard 8-gallon fuel tank, this engine can run for about 11 hours which is impressive for its small tank of fuel. This incredible run time of the generator can help you get through a night of blackout easily and still offer some more. Owners of the Gentron GT10020 can choose from 1 120/240V AC twist lock outlet, 4 120V AC 3 spring grounded outlets, 1 240V AC twist lock outlet, and 1 12V 8.3A output for charging the battery in the case when power is required. The warranty on the Gentron GT10020 is not a strong point which can be seen from a two-year limited warranty for consumer use and just a 90-day warranty for commercial buyers. Durostar DS10000E could have been the star of this list if only one thing could be avoided which we will come to later. 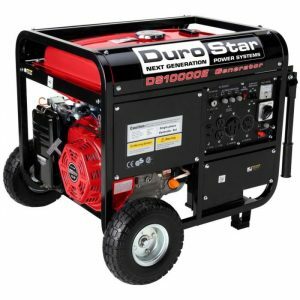 The Durostar DS10000E is well set in this segment of generators with comparable specifications with the higher end competitors in this comparison and its highly affordable prices. It is run with a 420cc Duro Max OHV engine which is air cooled to offer a longer run time. This engine churns out a nice 16 HP of power and produces 10000 peak watts of power as well as 8000 watts of ratted power. This power generator is more than adequate for all the work that you can throw at it and ensure that RV or home is powered in case of emergencies as well as can help you out on a job site. The caveat of this generator as mentioned before is that it only offers a measly 2 120V 20A 3 prong outlets which are barely enough for anything. Though it also offers 1 120v/240V 30 Amp twist lock outlet, 1 120V 30 Amp twist lock outlet, and 1 120V/240V 50 Amp heavy duty outlet it still might end up being short when required and hence could a be a deal breaker for most. This generator is backed by a 3 year residential warranty and a 1 year commercial warranty which is on par with all other generators in this list of comparison. The 10000 watt generators will definitely meet your household needs for whole house generator, with the sufficient amount of electricity for full efficiency. You can power on one to two refrigerator conveniently as well as other essential appliances such as your Air Conditioner, Television and Bulbs among others. These 10000 watts generators are also recognized to be effective for construction activities as they offer sufficient power supply to keeping a whole lot of activities and electrical tools working effectively. In addition, they provide the amps required for high power devices like table saws and air compressors amongst others. Their movability and durability makes these generators very ideal for outdoor activities. Hence, you are going to wish you had purchased one when the need for these generators arises. Furthermore, it is seen that the internet is quite full of different reviews, many of which is based on people’s experiences. 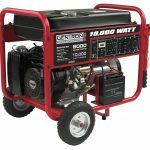 However, the best five (5) 10000 watts generators that has gathered the best 10000 generator reviews overtime includes the DuroMax XP10000EH Fuel Powered Generator, Pulsar PG10000B Portable Dual Fuel Generator, Powerland PD3G10000E Generator, Sportsman GEN10K Generator and Dual Star DS10000E HP Generator. DuroMax XP10000EH Fuel Powered Generator: Overtime, this particular generator has been recognized as the most powerful and effective 10000 watt generator by various users. By far, DuroMax XP10000EH Fuel Powered Generator has 5.0 star ratings from over 500 reviews combined, indicating that it is really reliable and efficient. This generator weighs 249lbs; you can power the generator by using either gasoline or propane with the ability of substituting use midway in minutes. When powered on, the generator produces between 8000 watts to 10000 watts of power, this is unmatched when compared to other types of generators sold in the market. Equally, the generator operates silently and it is best used for producing electricity supply to your house appliances. Pulsar PG10000B Portable Dual Fuel Generator: This generator is also regarded efficient and effective for use. Although, it is quite expensive and has less reviews than the DuroMax XP10000EH Fuel Powered Generator. It is however, the second best 10000 watts generator you can purchase with your money without regrets. Specifically, this generator can pull through tedious activities and still provides you with sufficient amount electricity supply. The product comes with about two years warranty once purchased. 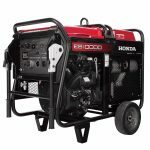 The generator also uses gasoline or propane and you can use either of the two, depending on which you are comfortable with. Powerland PD3G10000E Generator: This 10000 watt generator has been recognized to be cost effective in terms of fuel consumption. 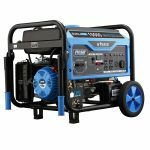 It specifically operates on gas, natural gas or on propane and has equally been reviewed as another ideal generator that can be purchase without regret. The Powerland PD3G10000E Generator is made with a 16hp engine that practically produces 10,000-8,000watts when switched on. And also with a 4.5 stars rating from reviews, this generator is economical as compared to others. Sportsman GEN10K Generator: This generator is also very ideal/effective for powering up electrical tools or home appliances at a fuel friendly cost. 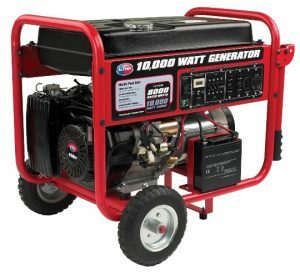 By far, the Sportsman GEN10K Generator has a 4.5 stars rating from people who have directly and indirectly used the generator. When compared to the first three generators, the Sportsman GEN10K is widely used and it weighs nothing less than 270Ibs. Precisely, the generator comes with an 8gallon fuel tank; this can hold a larger quantity of gas in order to generate eight hours non-interrupted electricity supply. Dual Star DS10000E HP Generator: Among the discussed powerful 10000 watt portable generators, the Dual Star DS10000E HP Generator although considered quite noisy but still produces exact 10000watts for consumption. Majorly, the generator is used in powering an air compressor and can equally be used once in a while in powering home appliances. It runs on only gasoline, a disadvantage when compared to others. The advantage of this generator is that it can serve you for many years due to its high quality built materials. The ability to run on different kind of fuel such as natural gas, gas, propone or gasoline. Provides exactly 10,000watts peak and 8,000watts rated. Runs for 10-12hours at 1/2load uninterrupted. Has effective panel customized with oil caution, key starts switch circuit breaker and volt meters. Have units that are cost effective when compare to home standby generators. Portable for use anywhere at any time. Has quiet exhaust with built in-spark arrestor. Works longer and efficiently without malfunction. They are expensive for purchase, but fuel cost effective. Nevertheless, when people intend to purchase a generator they are prone to making a desperate decision without appropriate plan on which type to purchase when they get to the market. As a result, they skip critical analysis on the purchased generator, safety measures and features. It has however been reported that a lot of people die yearly from carbon-monoxide poison emitted by generators. Unwarranted risk and dangers, you can purchase the 10kw generators. The benefit of using a portable generator is that its 10000 watt power supply can handle every of your household appliances effectively without malfunction. When connecting this type of generator to your home, you will have to get a transfer switch, this make your home and appliances safe. With the transfer switch, you can successfully switch in between your generator and general power supply, thus preventing any harm that might be tending to affect your generator or appliances. Ideally, you would need the service of an electricity exert who is very much familiar with the installation and connection of the 10000 Watt generator. Many preferred transfer switch for this type of generator has a big 50A plug which allows easy connection of this generator to your appliances. While the generator is quick, safe and easy to move from one location to another, it is also very convenient to disconnect. 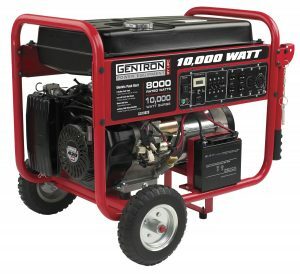 There are however some limitations to connecting a 10000W portable generator to your home, most especially during a power outage. Hinged on the size and quantity of your home appliances, a 10000W generator will normally imply that you have to let go some circuits within your home in order to allow the maximum watts that the generator produces. Meaning, you would have to select some specific circuits that should be run by the generator. Furthermore, while you might not want to overload your generator in order not to develop a circuit breaker trip off; it’s best you calculate the required consumption of power (although difficult), just to meet the capability of your generator. Specifically, there are numerous household appliances that switch on automatically as a result of their thermostat features; hence you can’t completely have total control on the amount of electricity you consume. To estimate the required consumption that might need the capability of a generator, you can begin by looking around your home and listing the essential equipment that will be used regularly. Advisably, you can use cooking gas for preparing your meals when running a generator rather than to use electric stoves which consume massive quantity power. Using water heater on your generator is practically a bad idea, as it might damage your generator. On the other hand, air conditioners and refrigerators are not entirely bad appliances to be used when you generator is running. 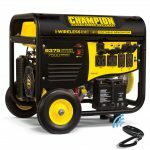 Some household appliances that could be used with your 10000 watt portable generator include: Plasma TV, Desktop Computer/Laptops, Sound system, Microwave Oven, Air conditioner, Deep and Mid-sized refrigerators as well as Sump pumps among others. It is however impossible to run all these appliances and more at the same time, hence a 10000 generator is capable of handling the essential appliances at a time. Importantly, overloading the 10000 Watt generators can put you at risk of destroying the generator completely or causing a fire outbreak, hence it is usually suggested that you never guess the generator watts but to take time in researching their features and wattages before purchase. It is a known fact we love protecting our foods once there is a power outage, and with a generator, you can be sure that your food are very safe in your refrigerator. As stated in the generator guidelines and safety measures, it is also important you don’t over use these generators. You can use them for about 10-12hours stretch within 24 hours before putting it off to rest. Also, it is recommended that the 10000 watt generators should be put on 15 metres away from your home or structures. Furthermore, with the increasing extreme weather conditions, many people are suffering from power outages all over the world. With cases of hurricanes, tsunamis, tornadoes as well as other natural disasters which have tendency of causing power outage for years; the 10000 watt generators have proven to be just like normal power supply due to their energy output and quiet exhaust. Thus, this generator can help in powering your required appliances as well as keep your family safe, even till and after the power is restored. For person who works off a property i.e. on construction sites, you can charge or power larger tools and equipment with the 10000 watt generator. However, always carefully read through your manuals before operating a generator and most importantly, make yourself also very familiar with the measures to maintaining the generators in order to keeping it working for years. Conclusively, when it comes to estimating the amount of gas a 10000 generator will need, you just have to check the capacity of the fuel tank and also you must have an idea on how long the generator can run based on the generator characteristics. As stated above, a 10000 watt dual fuel generators can use more than one type of fuel and can work for longer hours. Therefore, whenever you decide on buying a 10000 watt generator, one important thing you should consider is the amount of power your home requires nevertheless, if you have more devices/equipment that is over 10000W, you can then purchase a 12000-15000W generator. Interestingly, these generators are most times hooked up to your homes actual power supply distribution board with a transfer switch which can automatically switch on once the utility power shuts down. In an emergency situation it is important to know that a best portable generator can assist you with critical backup power supply. These particular types of generators have made tailgating and camping more fun and comfortable due to their portability. Equally, a lot of contractors have appreciated the effectiveness and flexibility of moving the generator from one job site to another. While they include covered outlets in in order to protect the units when not in use, the 10000 Watt generators comes in different sizes with about two years warranty period.